I am a Year 8 student at Tamaki Primary School in Auckland, NZ. I am in Room 9 and my teacher is Ms. Komor. 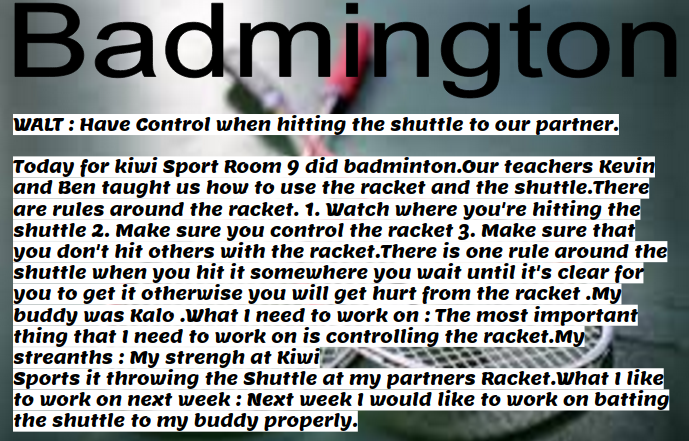 WALT : Have Control when hitting the shuttle to our partner. 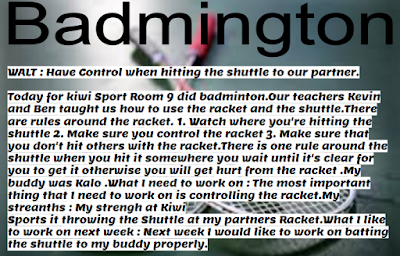 Today for kiwi sport we did Badminton.We learnt different kinds of skills around Badminton.We also learnt the different ways of using the Badminton equipment.One of the things that I have learned from Badminton is that when you are batting the Shuttle with the racket always controll it the way you want to hit it. Kia ora my name is Kahlicia and I’m 12 years old. I go to Tamaki Primary School. I’m in Room 9. My teacher's name is Ms Komor. My favourite subjects are Reading, Maths and Arts. My favourite food is Sushi and hot chips. The sports that I like to play is Basketball and Touch. The things that i’m looking forward to is completing my work on time. My strengths are making new friends in my class. The people that I admire is Ms Aireen. Today I have written a reflection on my birthday.I had put some facts about what I had done for my birthday. WALT write a reflection.